The Soulshake Express is a Swedish quintet which is heavily influenced by rock bands from the 60's and 70's, they combine the sound of that era with heavy riffs and a modern production. The band started in 2003 and in 2010 the legendary German TV   show Rockpalast recorded a concert of The Soulshake Express. The opening track is called Barking Up The Wrong Tree and shows that they now just revived the sound of the past, they also manage to preserve the warm sound. After an interlude called Intermission 1 they present the title track Join The Carnival, slowly kicks off the bluesy tune, but then they rock! Back to the opening theme - at least for awhile. 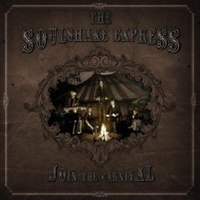 Great guitar play and emotional vocals, every fan of 70's rock should dig The Soulshake Express! With White Dots they show a more psychedelic sound. Some songs are real rockers, others shows the psychedelical side of The Soulshake Express - but what's most important, all songs have the authentic sound of the 70's! So I recommend to enjoy Join The Carnival! Let the guys take you back in time!